HomeElder I. Batman: He Showed Up! Elder I. Batman: He Showed Up! At church this week we invited a lot of people and no one showed up. We tried to help them get to church and no one showed up. It was so frustrating. We prayed hard for some investigator a show up and have a spiritual experience in the church. It seemed that no one would show up, I was a little disappointed. 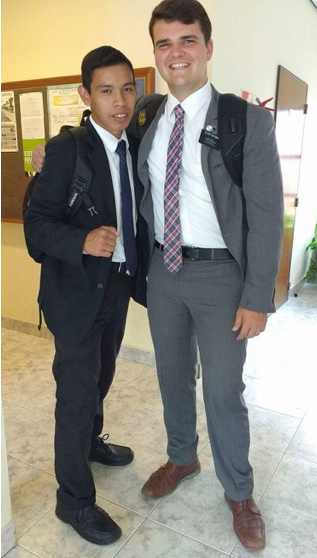 And in the final hour, right before sacrament meeting, SANTIAGO SHOWED UP. Santiago is the son of Miguel Santucho. He is 12, and showed up after playing futbol with his amigos. After church we talked with him and He had a good experience in the church and asked us if he can be baptized just like his dad. Miguel said to him that this is your decision and I dont want you to feel obligated. He said I have been thinking about this for a long time and I feel ready, I want to do this.